The concrete curing process involves a reaction between Portland cement and water helping on releasing heat from the concrete at a desired and controlled rate. Without curing, moisture is lost too quickly and there isn't enough water necessary for the crystals to grow, resulting in weaker concrete. Concrete should be placed ideally in conditions between 50 degrees and 75 degrees Fahrenheit, and this temperature must be maintained during concrete curing. If it is too hot or too cold, the crystal growth process is either curtailed or accelerated, leading to weak results. The proper curing process is vital to quality, durability, strength, water tightness and resistance to freezing and thawing. Curing concrete with water prevents excessive loss of moisture as the water will create a layer for an extended period of time that can control the evaporation of moisture from the surface. After some time the concrete will start the chemical reaction that will eventually harden the concrete. Even if alternative curing procedures are used, it is desirable that a certain amount of water curing is done to prevent cracking. Immersion: Immersion curing is usually done during concrete testing when curing concrete test specimens. Ponding: Used to cure flat surfaces on jobs or controlled areas where water can be easily retained on top of the concrete slab. Sand or earth dikes surround the slab and a layer of water is maintained on top of the slab. Fogging: Fogging or misting is used in circumstances where temperatures are above freezing and there is low humidity. Fogging raises the humidity above the curing concrete by spraying a fine mist of water regularly across it to maintain moisture. Wet Covering: Curing concrete with wet covering is done after the concrete has hardened sufficiently and the water covering will not damage concrete’s surface. A covering is usually sand, burlap, canvas or straw that is kept continuously damp during the curing process. 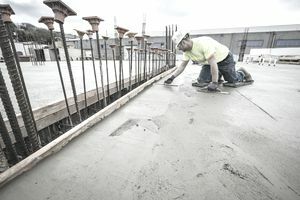 Curing concrete with a membrane or plastic sheeting is the most practical and efficient way to cure concrete in today's construction industry—sometimes water is unavailable for water curing or, if it's done improperly, it can affect the strength or the surface finishing of the concrete product. A minimum thickness is required to ensure adequate strength in the sheet; ASTM C 171 Sheet Materials for curing concrete specifies 0.01 mm. Concrete should be covered with a membrane, either plastic or chemical compound that will seal off the pores and retard the evaporation of water from concrete. Plastic Sheeting: Curing concrete with plastic sheeting requires covering all exposed areas of the concrete as soon as possible without damaging the concrete finish. When plastic sheeting is used over flat surfaces, such as pavements or slabs, it should extend beyond the edges of the slab by a length of at least twice the thickness of the slab. Membrane-Forming Curing Compounds: Curing compounds are chemical products usually sprayed directly over the concrete surface and allowing it to dry. The compound forms an impermeable membrane that retards the loss of moisture from the concrete. The most common process is nowadays to cure concrete is using a curing compound. The chemical needs to be applied once the concrete is hardened but still was water content on it. If you wait until all water evaporates, then the curing compound might not produce the best results. Be sure to use the right sprayer to create a uniform coverage and the right amount of compound is applied. There are many products that can be used so be sure to read the manufacturer's application before applying it. How Soon Do You Need to Start the Process? Curing concrete is required to allow a transitional and constant evaporation of water from the concrete mix. So, how soon do you need to start the curing process? It all depends on the environmental conditions in which the concrete is placed and whether it is placed in between forms, directly over the ground, submerged in water or in any other specific area or environment that will affect the concrete curing process. The best practice is to cure the concrete shortly after the chemical reaction has started that hardens the concrete. Concrete should not be allowed to dry fast in any situation, and the curing conditions must be maintained during the first 24 hours or at least until the final setting time of cement has passed. Are You Using the Right Cement When Curing Concrete During Winter?